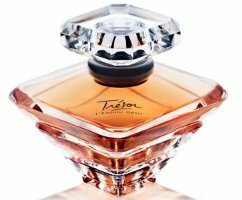 Lancôme has launched Trésor L'Absolu Desir, a new 'sensual and intense' flanker to the 1990 version of Trésor. Trésor L'Absolu Desir was developed by perfumer Dominique Ropion; notes include rose, jasmine, cedar and vanilla. Lancôme Trésor L'Absolu Desir is available in 45 ml Eau de Parfum. Not a fan of the original Tresor, nor most of the Lancome line for that matter, but if it’s by Dominique Ropion, it’ll go on the “sniff” list. I am behind, I have not even smelled the Tresor Midnight Rose yet. it smells more like Tresor in love than original Tresor. as you would expect, it’s in Tresor in love’s bottle. they’ve darkened it and quitened it slightly. I’m guessing this is to make way for the heap load of violet they added. I also think I detected a bit of lavender, but it’s mostly just violet. i used to love Tresor I know its their best seller.I have a bottle of it but its not the same like it used to be.This one is more hair spray sharper and stronger gives me a headache some times.I would try this and see. Nothing is the same as it used to be, sadly! The original Tresor was a genuinely great Sophia Grojsman fragrance that has been destroyed in the reformulation. It’s sad to see what they’ve done to it. This one could be anything, but the list of notes is uninspiring, and I don’t have much faith in Lancome any more anyway: they’ve ruined such classics as O and Magie Noire, not put out anything worth owning in years, and in short squandered their inheritance like most of the other great perfume houses. Anything by Dominique Ropion warrants a sniff!